Thanks to Camp Cohen webmaster Joey for taking this photo! There are so many other people who are deserving of my thanks but I’d be here forever if I was to try to list everyone and then there would probably be the dreaded accidental omission of someone so I dare not. Those of you reading this know who you are and you know I will be forever grateful. Of course a special thank you is extended to Leonard, his wonderful band and crew and of course Adam for all being the most genuine people I have ever met and are definitely regarded as friends. 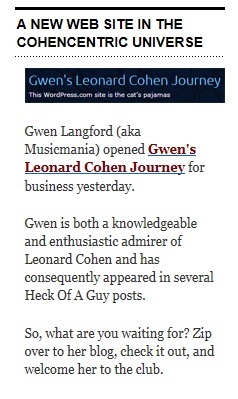 This entry was posted in Adam Cohen, Friends and tagged Adam Cohen, DrHGuy, Leonard Cohen.